Limbo Developer's Next Game Even "More Weird"
Indie developer Playdead drops the deets on its next title, and it looks like we're in for more color, more dimensions, and a whole lot more "crazy." In 2006, Danish developer Playdead started working on a secret game project for the Xbox Live Arcade. At that point, the company didn't have to do much to keep information under wraps; after all, no one knew who the hell they were. Four years later, the company's first title, Limbo, hit the scene as the highlight of 2010's Xbox Live Summer of Arcade promotion and within only a month, over 300,000 copies were sold and the game had received more critical praise than most of its contemporary AAA titles. Now, things are a little different for Playdead. Everyone is waiting to see what it will produce next, but Dino Patti, the company's CEO, isn't going to tell his fans anything more than a few vague, but interesting, hints at what his second project entails. "The next project is more crazy than Limbo," says Patti, "if you say that's crazy. It's more weird in many ways." He also mentioned that the game "looks crazy good," (the game is apparently very crazy) and it's "more 3D than you would think." 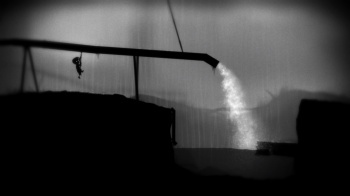 Even if we can't know the title or the premise, Patti did confirm a few more happy facts, including that the game will be in color (unlike Limbo's grayscale silhouette haze), single-player (at least "for now"), and that Playdead aims at a multiplatform launch (a big expansion from last year's Microsoft-focused release). That's quite a bit of information about a game that Playdead doesn't want to talk about, but hey, I'm not complaining. Based on the success of its first outing, the company recently bought out its initial investors, meaning all of the restraints on its creative control have been lifted this time around. According to Patti, that means good things for his company's second at-bat. Still, as much as he doesn't want to frustrate gamers, he's also claimed the development cycle on this project will be three and a half years, and as of now, Playdead has only been working the new game for about a year. Ouch. If you're a Limbo fan, it looks like there may be quite a bit to look forward to with Playdead's second title. Yet, as much as I prefer originality to franchise-milking, I remain slightly disappointed that for all this game is, it isn't a Limbo sequel. I applaud Patti and his team for cooking up something new, and I'm pretty sure that whatever gets released will be great, but still, it's hard to accept the fact that something that you love is over - sort of like that last episode of Firefly.